SharePoint Health Analyzer in Central Admin site gave the alert banner "The SharePoint Health Analyzer has detected some critical issues that require your attention. View these issues". On checking, found "Drives are running out of free space" and "Drivers are at risk of running out of disk space" errors logged! Available drive space is less than five times the value of physical memory. This is dangerous because it does not provide enough room for a full memory dump with continued operation. It also could cause problems with the Virtual Memory swap file: New Volume (SharePoint-Server- C:\). Root cause: By default, SharePoint needs at least 2 * RAM size of free disk space on C:\ of your SharePoint servers. 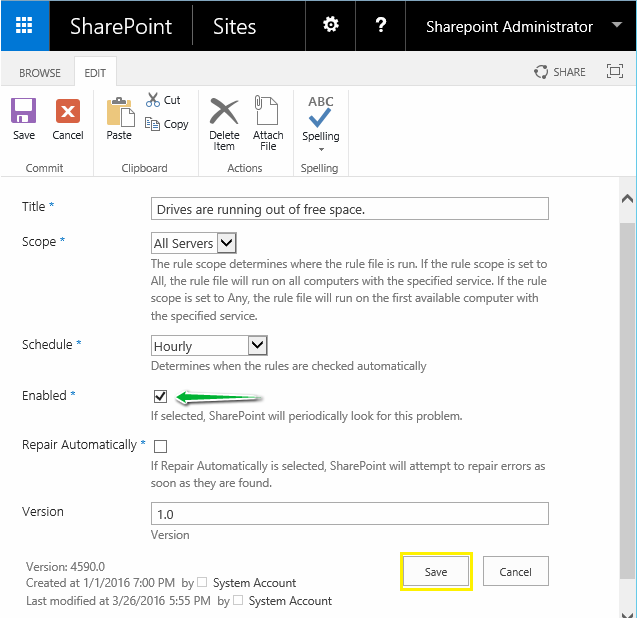 E.g If you have 16 GB of RAM in your server, then SharePoint checks if you have 80GB of free space in your system drive. If you don't then SharePoint logs an Error in health analyzer. 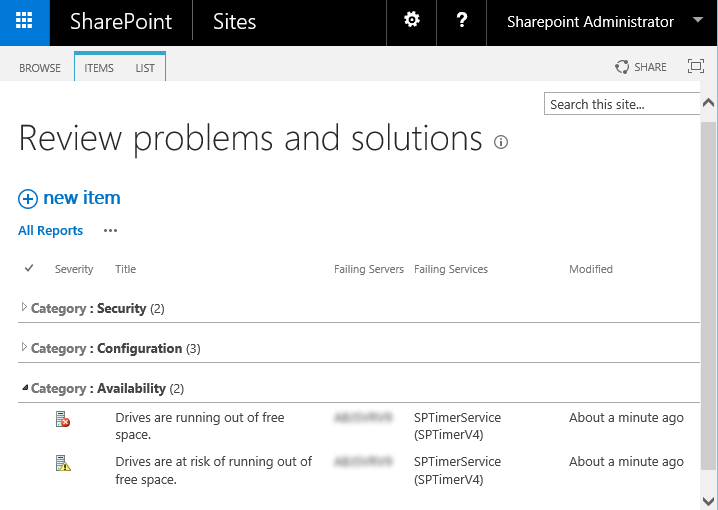 If you don't have 5xRAM Size, then SharePoint logs an Warning. How do I fix this issue? Well, you have to increase the disk space on your C:\ to 5 x RAM Size (or remove old files, cleanup Logs, etc). In General, If you have enough free space, This alert can be ignored. Under "Health Analyzer", click on "Review rule definitions"
Under Availability category, click on the "Drives are running out of free space" rule. In the view page, Click on "Edit Item" and then uncheck the "Enabled" checkbox. Hit "Save" button to commit your changes.